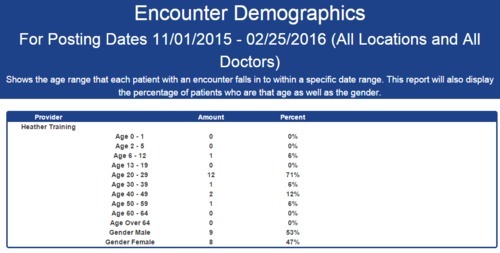 The Encounter Demographics report is an Advanced Report that shows the age range that each patient with an encounter falls in to within a specific date range. The Encounter demographics report analysis the encounters during a specific date range and lists, by provider, the age and gender demographics of the patients seen. Encounters must have been created during that date range and will be included in the statistics regardless of whether or not they have been signed, billed, etc. Provider — The rendering provider on the encounters. Amount — The number of patients who fall in a certain age range or gender. Percent — The percentage of total patients who fall into that demographic range. Table - The report will display the data in a table with the following information: Provider Name, Amount of patients in each age group, Percentage of patients in each age group. The bottom of the table shows a gender breakdown. A separate, smaller table shows the Grand Totals for all providers. Start Date - The starting date for the report. This will default to today's date. End Date - The ending date for the report. This will default to today's date.